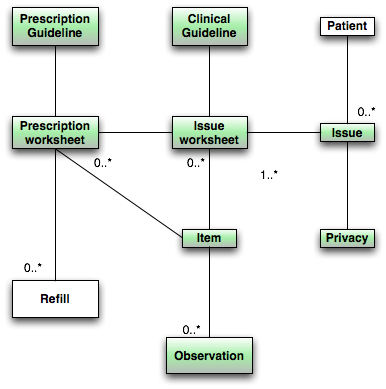 In this diagram, I’ve replaced the “prescription” object with a “prescription worksheet” that works very similarly to an issue worksheet. It’s all very logical; each pharmacological therapy or product comes with a set of guidelines that include when it’s to be used, what steps to take before using it, what values to check, etc. All of this is very similar to a clinical guideline but centered around a prescription. So it makes a lot of sense to treat it almost exactly the same way as issues, except it isn’t kept at the same position in the object dependency tree. We don’t want the prescriptions up there commingling with diseases, but rather somewhere lower in the tree. However, the items and the values of those items (“observation”) can overlap with those used in issues. For instance, the item “creatinine concentration in serum” can be used both in an issue and a prescription worksheet, if the prescription guideline says that the product should not be used, or used differently, in renal failure. So some items will be used in prescriptions, some in issues, and some in both.